Evidence shows that the Snapchat developer is poised to become a pioneer in this space. Snap Inc. wants to be known as a camera company. The developer of popular disappearing message app Snapchat has long shrugged off comparisons to social media rivals Facebook (FB - Get Report) and Twitter (TWTR - Get Report) , hoping to emphasize its visual-first approach to how we communicate and consume media. For a while, Snapchat was able to hide behind a smoke screen of mysteriousness to keep off competitors. That all changed when Snap decided it would go public. The company on Thursday publicly filed its long-awaited Form S-1 with the Securities and Exchange Commission, paving the way for an initial public offering expected in March that could value Snap at $20 billion to $25 billion. The filing provides an in-depth look into Snap's vision and operations, as well as a candid look at some of the substantial risks it could face once it begins trading on the New York Stock Exchange under ticker symbol "SNAP." Investors already are curious as to how the camera company will keep up its rapidly surging revenue stream. Between 2015 and 2016, Snap's revenue shot up to $404.5 million from $58.7 million, according to the filing, even as losses grew from $372.9 million to $514.6 million. The answer may already be out there, however. Studying some of Snapchat's latest features and its parent's acquisitions -- and adding a mild dose of speculation makes it abundantly clear -- Snap is becoming an augmented reality company (AR). To see how, look no further than Snap Spectacles, or the lenses and filters that can be applied to photos and videos. Both integrate augmented reality technology, which in its simplest form involves applying computer-generated graphics, sounds or GPS data to a real-world environment. Snapchat's popular dog-ear filter is an example of AR, while Spectacles even have some hidden AR features baked into them. When Snap released the $129.99 Spectacles last September, the glasses were widely perceived as a quirky, cool tech accessory that would make snapping easier. Experts have argued, however, that Spectacles are actually a resurrection of Google Glass, released by Alphabet's (GOOGL - Get Report) Google unit in 2013. The high-tech headware was quietly killed off last year. Spectacles put augmented reality in the hands (or on the heads) of average consumers, while Google Glass mostly took off among Silicon Valley developers. Nintendo's (NTDOY Pokemon Go also has raised consumer awareness of augmented reality tech. "Spectacles are the best AR glasses available right now," said Lindsay Boyajian, chief marketing officer at Augment, which provides augmented reality technology solutions. "Users don't have to learn a lot of the gestures that Microsoft's (MSFT - Get Report) HoloLens has or Google Glass had." Several of Snap's recent acquisitions further point to the company's bigger ambitions for augmented reality. Snapchat reportedly purchased Israeli augmented reality startup Cimagine Media for $30 million to $40 million in December and is said to have acquired computer vision startup Seene last June. Seene uses face-scanning technology to transform 2-D images into 3-D images on a users' screen, a core function of augmented reality. Snap representatives declined to confirm whether either of the rumored deals took place. Song recognition app developer Shazam in December also announced a partnership with Snapchat that could show there's more to augmented reality than what's just in the camera. "I think [with Shazam] what they've learned is that they're trying to prove that the app and the camera and the sensors can do more than capture images," said Cathy Boyle, a mobile analyst at eMarketer. "I think they're going to leverage more with the sensors on this device." Snap also may end up embracing its inherently social media-like nature when it comes to augmented reality. Snapchat already registers things in real-world environments, such as a user's face captured by a smartphone camera. The advent of augmented reality could take that even further in a social sense, Boyajian said. "Facial recognition could be huge for social," Boyajian noted. "[The sensors] could recognize your friend's face and then pull up their most recent Snapchat story. If you're walking around the street, maybe there's a billboard for CNN and you can pull up a CNN story on screen. It will be able to enhance the environment around you." Those content partnerships that Snap has with media organizations also may hold the key to perhaps one of the most important elements of Snap's augmented reality future: how to monetize it. 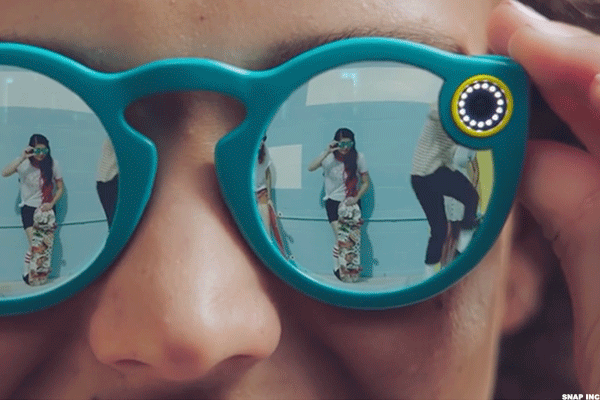 "I think Snap's really the one that's monetizing most of AR," said Loup Ventures analyst Doug Clinton, formerly a tech analyst at Piper Jaffray. "All these branded advertisements, geotags, they realize there's huge potential there." Snapchat said it generates "substantially all" of its revenue from advertising, adding that it made up 96% of its revenue in 2016. The company acknowledged that this heavy reliance could pose future risks, but it might also serve as a significant opportunity. "Brands are still on the fence about AR -- some really see the potential and some don't," Clinton said. "But I think when you see those dollar numbers come out from Snap and how much money they've generated from AR, we'll see more brands go into AR advertising through Snap and more excitement around AR in general."